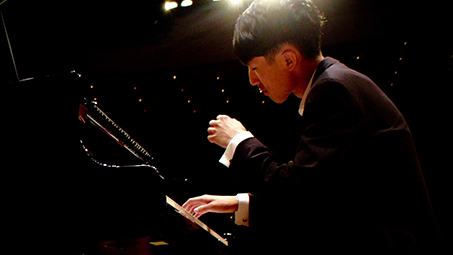 On Tuesday 2nd April, 2019, Eric Lu made his first appearance at Turner Sims following his success at the Leeds International Piano Competition. The scene was set with dimmed lights across the auditorium and a warm, muted spotlight on the centre-stage piano. As soon as Lu walked on stage, there was a hush across the audience, everyone excited to hear what this new young talent had to offer. First we heard Mozart’s ‘Rondo in A Minor’, and we were introduced to Lu’s ability in exquisitely gentle playing. Every note was incredibly precise, graceful and tranquil. This was a theme that continued throughout the performance. In every piece, Lu managed to capture controlled pianissimo that created an ambience of complete calm in the concert hall. In the second half, we heard technical prowess in the Handel ‘Chaconne in G,’ with a combination of speed and breath-taking accuracy. In a perfect contrast to the more meditative first half, Lu tackled the Handel with fervour and vivacity, lighting up the room by showing off the many variations on the sarabande theme that seem to increase in difficulty and speed as the ‘Chaconne’ goes on. This exciting sarabande preceded the final piece of the evening, Chopin’s ‘Piano Sonata No.2 in B flat minor.’ To balance this programme, the ‘Funeral sonata’ needed gravity, anguish and a focus on all of the colours and shapes within this piece. Lu conquered all of these elements to bring the concert to a resounding and poignant close. Sometimes, he would tip his head back and look upwards, showing his emotion and passion at particularly moving moments. The highlight of the sonata was undoubtedly the third movement, the ‘Marche Funèbre.’ Here, the sombre bass was matched effortlessly by the mournful right hand, and the energy we heard in the Handel fused together with the delicate quiet of the Mozart to create a beautiful culmination of all of Lu’s skills in this pivotal moment of the recital. Ultimately, Lu provides some soul-bearing moments of fire and passion, but the real pièce de résistance of his playing is the artistry with which the pianissimo moments are played. His playing fills with poise and beauty, allowing him to hold the audience in the palm of his hand. Not only does this showcase the quiet and reflective moments, but also accentuates the elements of intensity when they come, and for this Lu was rewarded with a resounding cheer at the end of his performance.